The waters of the Verde Island Passage are home to many threatened species, including sea turtles, hawksbills, green turtles and olive ridleys, as well as hosting thousands of endemic species. Now, the beautiful animals that call this passage home are fighting for survival against a wave of plastic pollution. 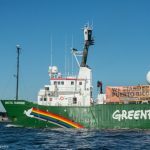 A three-day underwater exploration found single-use plastic pollution like sachets, some showing visible signs of being among the corals for a very long time. Among the branded single-use plastic pictured in the area were products from massive multinational brands Nestlé, Unilever, and Colgate Palmolive, as well as some local brands such as Zagu milktea, Nutri-Asia, and Monde Nissin. 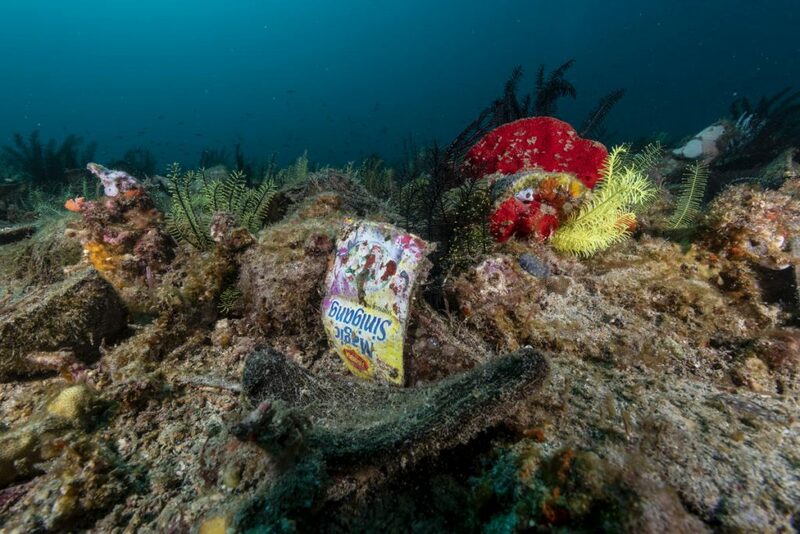 An old sachet of Maggi Magic Sinigang Mix, manufactured by food giant Nestle, was found in Verde Island Passage, the epicenter of global marine biodiversity, in Batangas City, the Philippines. Daily, Filipinos discard 163 million sachets produced by the biggest FMCG companies. The scale of this problem is HUGE. About 8.3 billion tonnes of plastic has been produced since the 1950’s and only 9% of that has ever been recycled. A whopping 79% of plastic produced ends up in either landfill or as pollution in the environment. 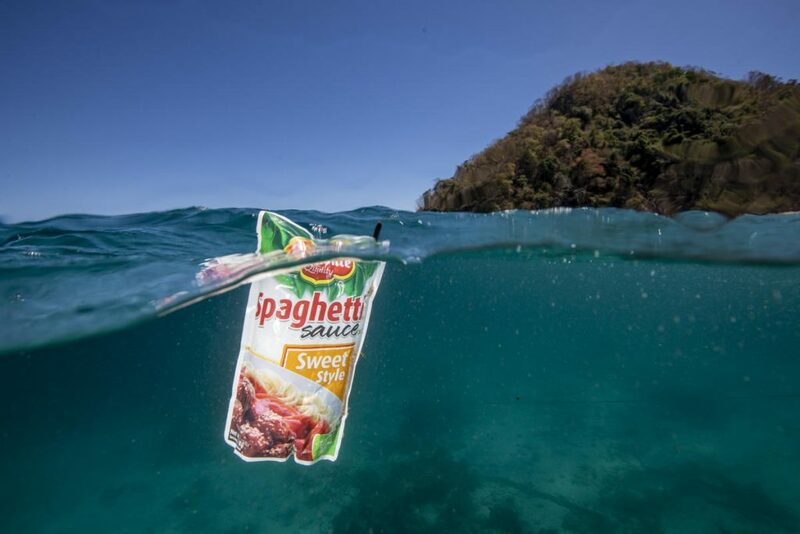 A Del Monte spaghetti sauce packaging was floating in Verde Island Passage. Part of the reason plastic is so harmful is the length of time it exists. Once disposed, plastics don’t naturally degrade. They absorb more toxic chemicals and break down into tiny particles that end up in our oceans, digested by wildlife, and even humans. Plastic particles have even been found in sea salt, drinking water, beer and human faeces. Ew! A small wrasse swims in Verde Island Passage. 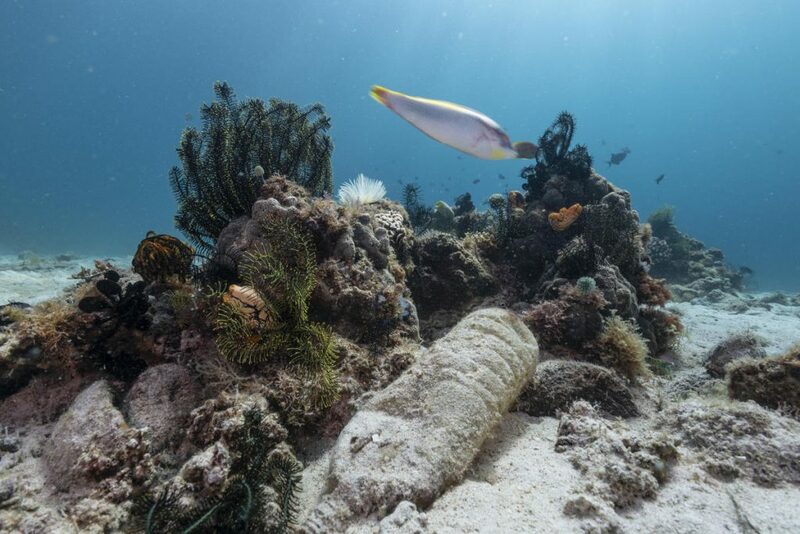 A plastic bottle is seen among the corals. If we don’t stop plastic production at the source, this problem is going to get much much worse. In the minute you’ve spent reading this piece, a whole truckload of plastic has entered the ocean. That’s on top of the five trillion pieces of plastic already in our oceans – enough to circle the earth 400 times over. You might be sitting there thinking about the last plastic item you used, or what you can do to reduce your own plastic waste. Whilst that helps, it’s important to remember who’s really responsible. It’s the massive corporations that create billions of tonnes of single-use plastics, making it near impossible for us consumers to completely avoid. These corporations need to be leading the charge and taking responsibility, which means a significant reduction in plastic production. 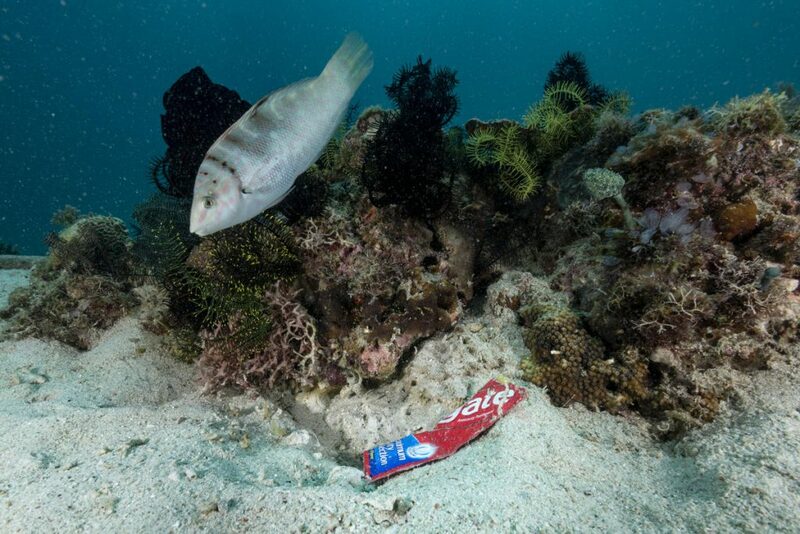 A small wrasse swims by a sachet of Colgate toothpaste in Verde Island Passage. We need to hold big corporations accountable for the waste problem they created. If they don’t make a change and reduce single-use plastic production, our ocean paradises will be lost. 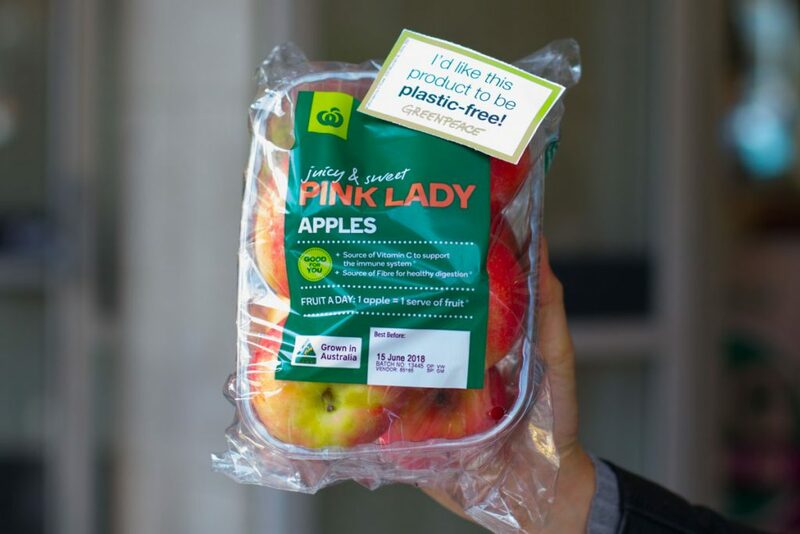 In Australia that means calling on our two biggest supermarkets, Coles and Woolworths, to stop using excessive, ridiculous plastic on fresh produce. We simply can’t afford to keep creating products that we use for a few seconds and pollute our planet forever. 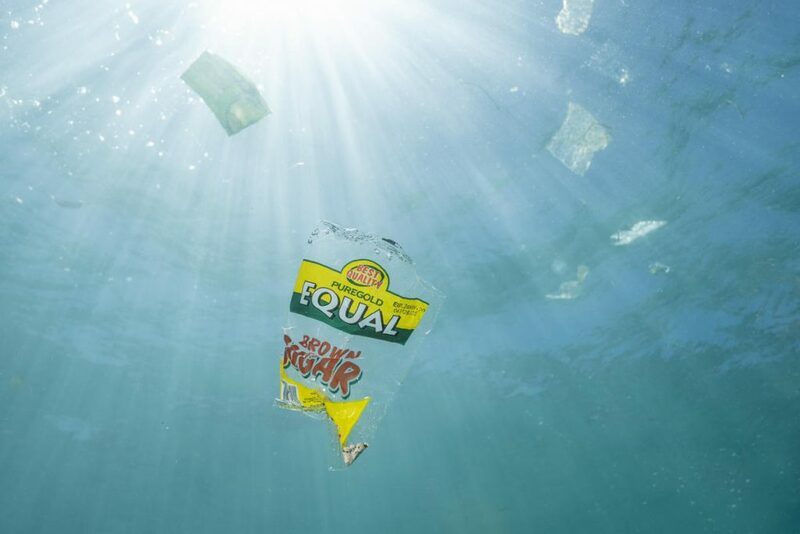 Coles and Woolworths have committed to minimal reductions in plastic, but we need to see way more action. Sign our petition and help us put an end to pointless plastic for good. 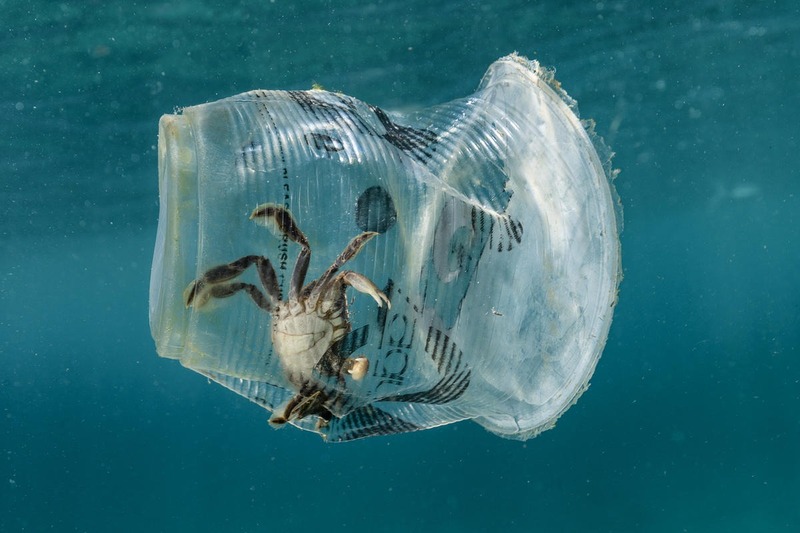 Plastic packaging was seen floating in in Verde Island Passage, the epicenter of global marine biodiversity, in Batangas City, the Philippines.